We now visit our supermarkets more frequently than ever before, two to three times per week in fact. This means our basket contains fewer items and being able to wander up to a self-checkout, with little to no wait time, has been an expedient way to shop. Most shoppers consider self-checkouts both fast and easy to use. Although this varies with age; 90% of shoppers aged 18-39 found self-service checkouts easy to use, only 50% of those over 60 years said the same. Shoppers also gain value from taking control of the transaction — being able to ring up their own goods and pack them the way they want. This is because a sense of control over their own shopping can lead to greater customer satisfaction and intent to use and reuse self-serve technology. But from a business perspective, moving from “staffed” checkouts to self-serve machines isn’t cheap. A typical setup costs around US$125,000. On top of that there are the costs of integrating the machines into the technology already in place — the software and other systems used to track inventory and sales, and the ongoing costs — to cover breakdowns and maintenance. 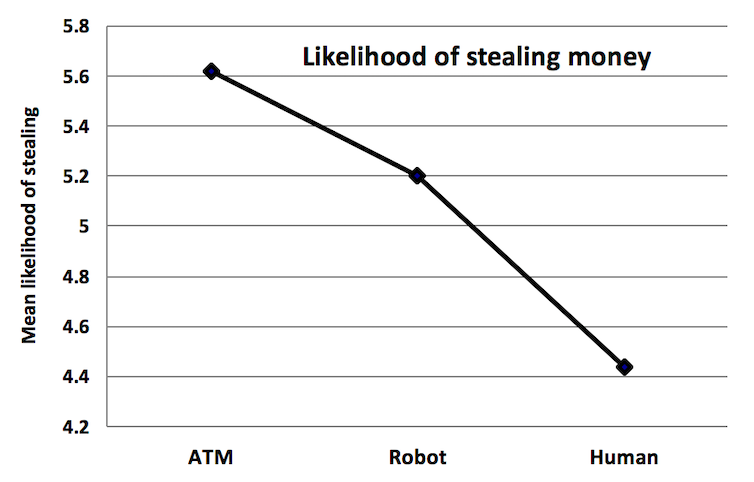 But the biggest direct cost to retailers of adopting self-service checkouts is theft. Retail crime in Australia costs the industry over $4.5 billion each year. There is reason to believe that rates of theft are higher on self-service machines than regular checkouts. A study of 1 million transactions in the United Kingdom found losses incurred through self-service technology payment systems totalled 3.97% of stock, compared to just 1.47% otherwise. Research shows that one of the drivers of this discrepancy is that everyday customers —those who would not normally steal by any other means — disproportionately steal at self checkouts. Studies also show that having a human presence around — in this case employees in the self-checkout area — increases the perceived risk of being caught, which reduces “consumer deviance”. This is why retailers have been adding staff to monitor customers, absorbing the additional losses, or passing them on to customers in an “honesty tax”. Gary Mortimer is an associate professor at the Queensland University of Technology and Paula Dootson is a research fellow and PwC Chair in Digital Economy, at the Queensland University of Technology.